Toddlers are naturally active and curious and they thrive in an environment that is tailored to their specific needs. 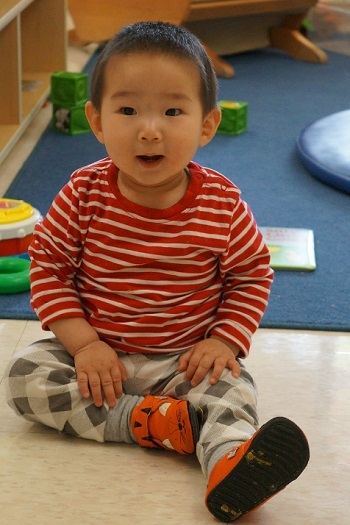 At Bluebonnet, toddlers are grouped according to age into either our young toddler class for children 18-24 months or our toddler program for 2-year-olds. Small group sizes allow our teachers to work with each child individually and establish a warm and loving relationship. Independence is an emerging skill for toddlers. As their bodies grow and develop, they begin to master the self-help skills that lead toward independence such as language skills, potty training, dressing and eating. Our toddler curriculum is filled with activities that strengthen these skills. We also offer classes to parents to help with potty training and other topics to help ensure that this stage of development is a smooth and pleasant transition. Sign language continues to be a big part of our toddler program. With the use of sign language young children who are continuing to master their language skills have a way to communicate easily. By using a few basic signs, that we will teach to parents as well, sign language is proven to lessen a toddler’s frustration and increase language skills. Cognitive development continues in the toddler program. As toddlers explore the world around them, they begin to learn concepts like texture, weight, size, etc. They also begin to understand how objects are built and taken apart. Toddlers love to sing, which is the pathway to literacy, language, math and other essential skills. In addition to singing along with their teachers daily, each toddler class enjoys a visit from our resident music teacher every week to reinforce concepts they learn everyday. Our playgrounds are specifically designed for active toddlers, who will receive additional physical exercise from highly supervised activities designed specifically for their age. In the warmer months, toddlers at our Cedar Park location can enjoy our outdoor splash pad.